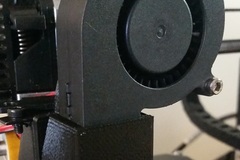 This design lets you mount a blower fan onto the stock cooling duct on a Duplicator i3 style printer. Make sure you print flat side down, and without supports. Don't forget to snap out the small posts on the inside after printing.